This has been a year for which we should all be proud. With sweeping advances at the state and federal levels, the LGBT community in Illinois and nationally have taken great steps to full equality. We are honored to work alongside you and our countless community allies to help make this possible. Please take a moment to consider a year-end contribution to our work going forward. 1) Marriage Implementation: Equality Illinois ensured that the Religious Freedom and Marriage Fairness Act, enacted on June 1, was implemented properly statewide. We educated the LGBT community on their marriage rights through educational forums and publications. In addition, we held county clerks accountable with frequent check-ins as they rolled out marriage equality in every county of the state. 2) Tax Implications of Marriage: Equality Illinois partnered with the Center for Economic Progress to host a series of five forums statewide to discuss the tax implications of marriage. Read our FAQs. 3) Updated Anti-Bullying Protections: With the leadership of Rep. Kelly Cassidy, the legislature passed a bill that strengthened anti-bullying legislation in Illinois. Equality Illinois is committed to helping all students feel safe when they are at school. 4) Executive Order on Non-Discrimination: In July, President Obama signed an executive order that expanded the protections for federal workers and contractors to prevent discrimination based on sexual orientation. 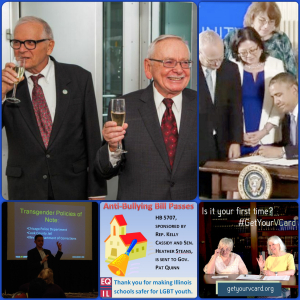 Equality Illinois lobbied in Washington on behalf of such action in 2014 and prior. 5) Name and Gender Marker Changes Guide: Equality Illinois launched this guide in early 2014, which outlines the process for changing your legal documents and includes copies of all the necessary forms. 6) LGBT Equality Institute: In May, Equality Illinois convened a day-long conference in downtown Chicago to discuss the future of the movement in Illinois. Over 120 individuals and allies from all over the state participated; networking and engaging with presentations from our community’s most passionate advocates on a wide array of topics: safe schools, senior care, transgender issues, faith outreach, immigration, etc. 7) ‘Get Your V-Card’ Campaign: Geared at encouraging young and/or recently moved voters to register to vote prior to the 2014 general election, Equality Illinois launched a ‘seductive‘ campaign ad encouraging you to get your V-card. 8) 2014 General Election: Equality Illinois also engaged the LGBT community and allies in issues relevant to the gubernatorial race and other contests in 2014 election. We partnered with top-tier endorsed candidates to contact voters via phone banks. Over 400 volunteers joined us and made over 60,000 calls this in September and October. 9) Raising the Bar: Equality Illinois honored law firms and raised attention to workplace equality with an appreciation event and this publication. As you know, this work is not done. Please contribute today to help keep this momentum going!